The most important piece of furniture in an African household is the seat, most often a stool or bench, as it is called in French: le banc. The Duala of the area now known as Cameroon, for example, believed that the owner’s mystical strength lay in his seat; it was therefore dangerous for another person to sit on it. This person could be hit by lightning if he did not possess a similar mystical force. To sit on another person’s seat was to openly defy him, and nobody was surprised to find the transgressor dead the next day. In Ghana, an Ashanti’s seat would be tipped to one side when its owner was absent, to ensure it would not be used in his absence. These backless seats were also used as thrones, albeit very ornately sculpted. A throne was not sufficient to make a king: the officials of the kingdom, who had assisted at the death and the burial of the previous king, were the only ones entitled to seat the new ruler on his throne, after a series of esoteric rituals. Wars have been waged over the theft of a throne. During journeys, a servant followed the king, carrying his travel seat, lighter than his usual one. Around a king, people either sat on the ground or stood up, while he sat on his personal seat and nothing else. The common mortal, of course, can also own his seat, as long as the model is appropriate for his social rank. The higher the tribal rank, the more prestigious and elaborate the seat. The most talented sculptors were chosen for this type of work. The sculptor chose an appropriate tree trunk and worked on it in the same way as a canoe, by setting a fire in a hole in the middle of both sides. He then worked on the wood through the hollow made by the heat. When professions were still easy to describe, the owner’s profession or special skill would be showcased in the sculpture of the bench. In later days, the owner’s name was often sculpted into the seat. This photo shows a contemporary take on the stool, by Padouk Design. 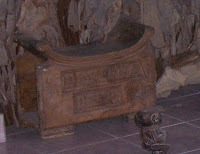 Akwa (another part of Douala), with her name sculpted on it. In a separate album, I put together a variety of African seats, which I will continue adding images to. Note: Padouk Design is a company owned by my husband and myself, currently not in activity.